Funny For Everyone is Dave Goldstein’s inaugural DVD. A little over one hour long, the DVD includes 24 tracks of what Goldstein is known for: original intelligent writing and great live riffs with his audience. 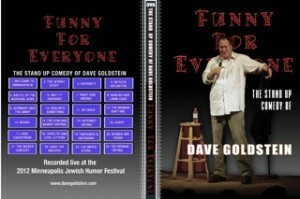 If you live outside of the United States and would like to purchase a copy of this DVD, please contact Dave directly.